Essex lack depth in their bowling attack compared to other counties, according to seamer David Masters. Essex lost by 20 runs in the T20 Blast quarter-final to Birmingham Bears at Edgbaston on Thursday, after the hosts posted 189-5 from their 20 overs. "It's no excuse but the lads have played lots of cricket," said Masters. "It's not like some of the big counties who can rotate their eight or nine seamers. We've got four or five first-team players who play every format." 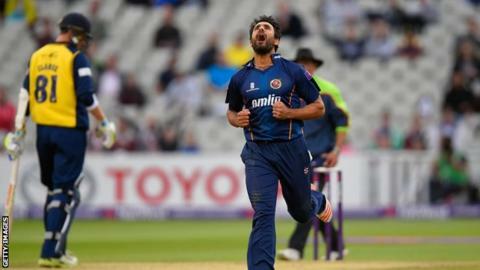 Essex's bowling attack has mostly consisted of a combination of seamers Graham Napier, Tom Westley, Ravi Bopara, James Porter, Reece Topley and Masters, with spinner Monty Panesar still making a comeback from off-field issues. And Masters was frustrated by the manner of their defeat in Birmingham. "No excuses, but I didn't think we were on the ball today as a fielding unit or a bowling unit," Masters told BBC Essex. "We've got a few ageing players as well and it's hard to hide a few in the field. "It was a good wicket but I think they got 20 runs too many, we dropped a few catches and had a catch off a no-ball. "I think if we'd have been chasing 170 we'd have been there or thereabouts."